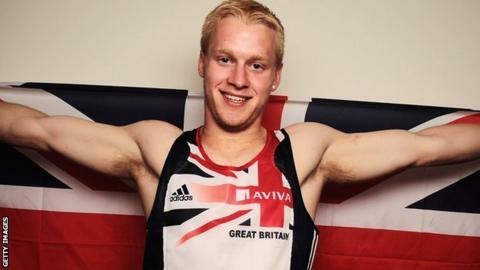 Great Britain sprinter Jonnie Peacock has set a new 100 metres world record in amputee sprinting, at the US Paralympic track and field trials. His time of 10.85 secs beat those set by both Oscar Pistorius and the 2004 Paralympic champion Marlon Shirley. Single leg amputee Peacock, 19, was 0.06 seconds faster than the previous record set by Shirley in 2007. "All I've been asking for is a tail wind and I finally got one," said Peacock after the race. "This was only my fifth race this year. I've had headwinds for the two decent races I've run," he added. He later Tweeted: "Thank you so much everyone for the messages. So happy right now even though drug testing took 2 hours..10.85. Look 4ward to London." Reigning 100m T43/T44 Paralympic champion Oscar Pistorius, who beat Peacock at May's BT Paralympic World Cup, also used Twitter to offer his congratulations: "Well done, great to see progress in the sport! Looking forward to a very fast race at London 2012."